URBN currently operate a UK Nominated Carrier Scheme (NCS) with Advanced Supply Chain Group. ASCG work with our landed / domestic vendors, on our behalf, to consolidate orders that are bought on DDP terms and deliver ‘bulk’ volume to our DC, in line with the intake week for which the orders are raised. ASCG offer a collection service, from your UK door; consolidating your freight at either their Bradford or Corby depot and delivering to URBN 24 – 48hrs later. There’s also the option for you to deliver into one of their depots, where your order will then be added to any other volume that’s already ‘on hand’. As a nominated carrier, ASCG benefit from a priority booking slot at our EU DC, therefore even in peak, any orders that move through their network will arrive with us, as anticipated. Also, by using ASCG, you (our vendor) will not be at risk of chargebacks, for failed or late deliveries. We are very much focused towards the close management of ASCG as our nominated carrier, to ensure that the service received is in line with expectations and our SLA’s. As URBN’s volumes with ASCG increase, this will bring benefits to all, through economies of scale and drive improvements in the handling of volume through their network and into URBN. You must be a domestic landed vendor fulfilling product from a UK location to begin working with ASCG you must first send an enquiry email to URBN.NCS@advancedsupplychain.com as part of this first step ACSG will send you a credit check form and setup request form. If the credit check process is complete, the account management team will provide you with a login for the ACSG portal, through which you will be able to place booking requests and have visibility of your orders. 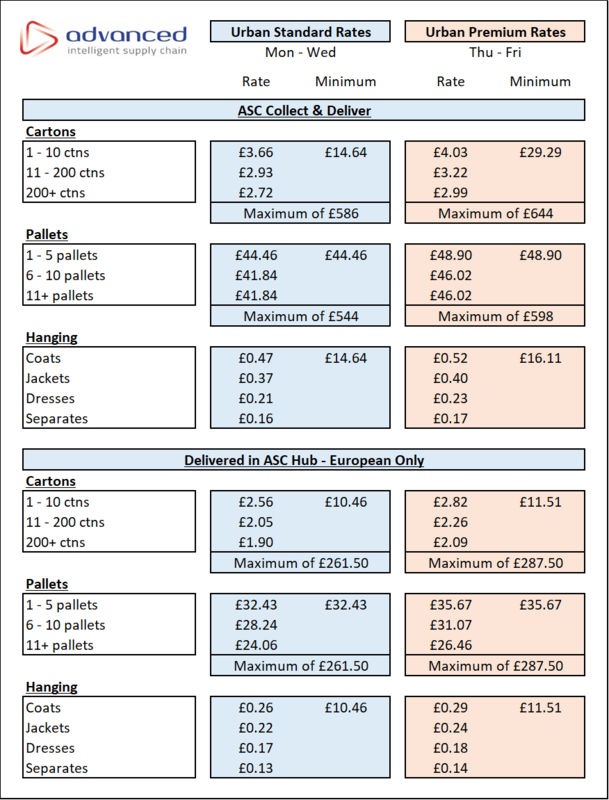 When making a collection booking request you must include carton and or pallet type and quantity information. All URBN UK DDP suppliers will be subject to the URBN business rules that stipulate that you will not be able to request a collection outside of the delivery window. ASCG will deliver your order into us within + or – 3 working days of the PO ship date. To ensure that goods don’t dwell in their facility the earliest collection that can be authorised is 3 working days prior to the PO ship date. Booking requests can be made in the system earlier than this, but they will not be authorised or physically be carried out until the intake week, when the product is due. If you are choosing to deliver your stock into an ASCG facility at Corby or Bradford, a booking slot will be allocated which will be between 9:00am and 16:00pm Monday to Wednesday. You will receive an automatic email once the booking has been confirmed by ASCG which will contain a unique reference number. Only goods submitted via the online booking portal, with a collection confirmed, will be accepted by ASCG. The ASCG Booking Portal enables all URBN UK DDP suppliers to amend requested collection dates to an alternative date as long as this is completed no later than 11:00am the day prior to confirmed collection/delivery. You will also be able to amend; quantities, type (e.g. carton/pallet). If ASCG arrive at the confirmed collection point and the goods are not ready for collection you will be invoiced 60% of the planned total collection cost (subject to a minimum charge of £50). Failed bookings will then need to be re-submitted using a new available date via the portal and you will be contacted with a new date once the booking has been re-prioritised by URBN. The above will also apply should ASCG, attend the collection points and stock is ready but not identifiable to the ASCG Driver or is non-compliant. Suppliers will be required to confirm that they are adhering to the URBN UK NCS Delivery Compliance Requirements as part of the online booking request. The stock ownership between Brand and URBN will transfer to URBN upon arrival into the URBN warehouse. Payment terms remain unaffected, stock will be receipted and posted in accordance to the usual terms agreed. The stock should therefore be covered under the suppliers’ insurance up to the point the title is transferred to URBN. This will also remain true for URBN owned stock.